Emily Carr House National Historic Site of Canada is a two-storey Picturesque-Italianate style house located on a residential lot in the James Bay district of Victoria, British Columbia, which was the childhood home of artist Emily Carr. The formal recognition refers to the building on its lot as of 1964. 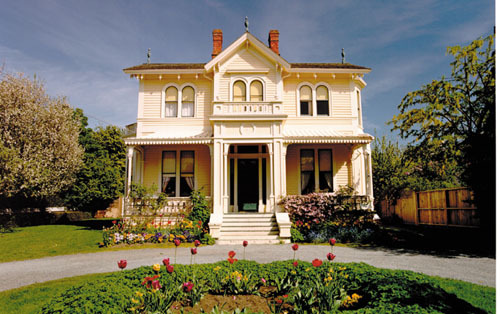 - it is associated with artist and author Emily Carr, who was born in this house. Emily Carr (1871-1945), one of Canada’s most famous painters and a well-known author, lived most of her life in this neighbourhood of Victoria. Built for her father, Richard Carr, the house and its environs had a profound impact on Emily Carr’s formative years, as she acknowledged in her books. It was here that her desire to create and her appreciation of art were kindled. The location of the house is significant because of its proximity to Beacon Hill Park and to the ocean shoreline, which played important roles in shaping Carr’s lifelong appreciation of the natural environment and her unique vision of coastal British Columbia. The house is an excellent and well-preserved example of a Picturesque Italianate villa designed by John Wright (firm Wright and Sanders), a prominent early West Coast architect. Source: Historic Sites and Monuments Board of Canada, Minutes, October 1964. - any surviving historic woodwork, wall finishes and detailing dating from the time of the Carr family’s residency from 1864 to 1937. Emily Carr House consists of a two-storey Picturesque-Italianate-style house on a residential city lot in the James Bay district of Victoria, BC.